Geothermal heatpumps offer you as a homeowner one of the most efficient, potentially greenest and cleanest methods of warming and cooling your home at a moderate initial cost. And it does not matter whether you are building a new home or wanting to take advantage of this with your current one. Retro-fitting can be readily undertaken. The technology is based on two main factors. One is the relative stability of soil temperatures throughout the year - warmed by sun exposure when it is out. The second is the efficiency of heat pump technology. And ground exchanging heat pumps are even more efficient than those using ambient air. Beyond about seven metres (23 feet) ground temperature does not alter at all with the seasons and surface events. Other factors control the relative heat from there down. More superficially, at one to two metres, there is some variation but it is minimal compared to external air temperatures. As long as we are using soil situated beyond any superficial ground freezing. At the deeper levels in the earth it is possible to harvest heat from spontaneous radioactive decay. This type of heat is more likely to be used by commercial operators or communities due to the depth required for drilling. One area in South Australia where this sort of deep warmth is at one of the highest recorded points on earth (250 degrees Centigrade four kilometres below the surface) such heat is being exploited. In contrast to the usual method of exchanging heat by pumping water down to be heated, free water exists there and can be directly accessed for its heat. It is possible to create vertically oriented collecting sytems for your house. And if there was some water source at that point it would be even more effective. One technique that is being successfully employed as a vertical harvesting system is using deep pile foundations not only for building stability but also as a geothermal collection point. The foundations serve a dual purpose. Also one drilling event serves for both requirements. 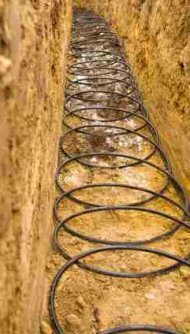 Water collections and damp soil are very efficient in exchanging heat for geothermal heat pumps. Water having such a high coefficient of heating, small temperature variations supply great amounts of energy. 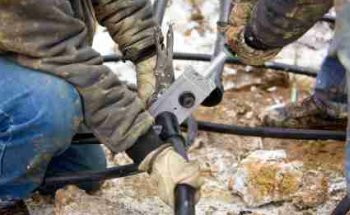 For most of us the cheapest and simplest method is laying collecting pipes in a horizontal trench or with the aid of directional drilling. One limitation in this technique is the available ground associated with the house. Small sections may not give sufficient ground area for efficient harvesting. In such case a vertical, pile-type, approach would be still possible for nearly any build. With the 1970s oil crisis Sweden became the first country to begin to employ geothermal heatpumps widely. Before that they had been used in a building in Oregon in the 1940s. And the technology was first mooted by Lord Kelvin. Even today thousands of units are being installed in Sweden, although the USA with its larger population is surpassing Sweden's yearly installation numbers. Water, with antifreeze added for those areas that require it, is pumped though pipes. Polybutylene which became available in the late 1970s revolutionised the laying of pipes. Copper is more thermally efficient but can corrode in the soil. The heat pump circulates the water and exchanges the heat brought back from the soil with the heat exchanger part of the pump, working with usual heat exchanging refrigeration technology. The heat pumps can be used for cooling or warming your house. And even if the soil temperature is relatively cold heat can still be extracted this way, pumping unwanted extra cold temperatures back into the soil. For cooling, heat can be sent into the ground, which will create more to be used when heating is required later in the year in just the same way that summer warmth tends to be retained so well. The quoted costs for installing such a unit vary from US$7,000 to US$20,000. In some areas there are subsidies that will help with this up front expense. 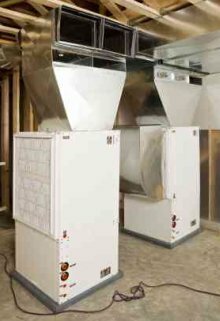 Running costs, though, make this the cheapest way to heat or cool any home. 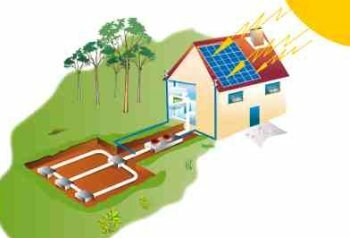 And depending on the way the electricity used to run the pump is generated, geothermal heatpumps can be the lowest carbon footprint method around.